Kristie Macosko Krieger turned her degree in sociology into a career as a movie producer and got nominated for an Oscar for Bridge of Spies. Benjamin Castle graduated with degrees in psychology and art history; now he leads sales at a major public radio station in San Francisco. After an internship and a seasonal job with NFL communications, American studies major Jacob Frank landed a job with the league’s new health and safety policy department and now manages it. Ofunne Okwadiafor studied communication and created Cocoa Swatches, a make-up application for people of color. What do all these Aggies have in common? A degree (or two) from the UC Davis College of Letters and Science. Letters and Science is the largest and most intellectually diverse college at UC Davis, offering more than 110 majors and minors. In fact, we have some of the most comprehensive, interdisciplinary majors in the country. Here you can bust disciplinary boundaries and carve your own educational path, pursuing and combining majors ranging from political science, history, international relations, statistics and Native American studies to theater, philosophy, geology, art and dozens of other disciplines at the core of a liberal arts education. What can I do with a liberal arts major? Most careers favor people who have a strong foundation in the liberal arts — the ability to think critically across disciplines, to communicate effectively, to work on teams collaboratively, to design and interpret data, and to apply knowledge in real-world settings. The College of Letters and Science makes it easy to pursue more than one major or to combine majors in ways that make you more competitive after college and fulfill personal passions. 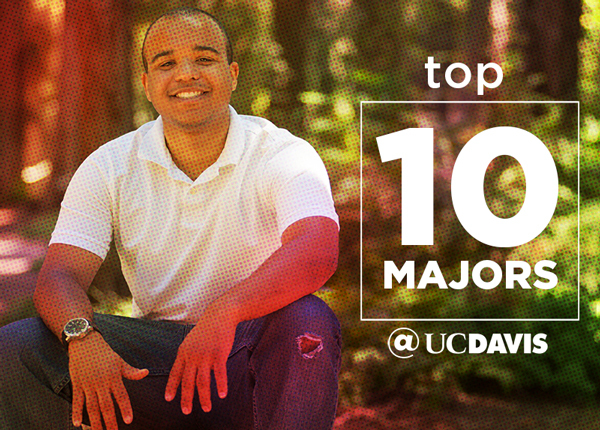 Home to half the majors offered at UC Davis, as we have said, the college provides some of the most comprehensive, interdisciplinary majors in the country. Our faculty listen to industry and to peers to create new majors and new courses to better prepare our students for emerging careers. For instance, the college has created a series of data studies courses through which liberal arts majors can learn how to apply their critical thinking and communication skills to the world of data. More than 20 companies in Northern California, including Silicon Valley, told the college they would like to hire graduates with critical thinking and big-picture skills in the social sciences and humanities. Our program in design is the only comprehensive academic design unit in the University of California system, delivering a research-focused undergraduate degree that fully integrates design history, theory and criticism, with design thinking, making, writing, visual literacy and creative practice. Studio courses include design as practiced in exhibition, fashion, information, interior architecture and product (lighting and furniture), textiles, visual communications (digital, environmental and print) and sustainable design. Letters and Science also makes it easy to declare a double major. Maybe you’d like to be a doctor in an underserved community. Why not major in African American/African studies and chemistry? Maybe you’re interested in developing the next generation of wearable technology. Why not major in design and mathematics? Want to be a documentary change-maker? Why not major in history and cinema and digital media? The possibilities abound. Whatever your passion or strength, you can make our majors your own. Our academic and peer advisors are here to help. No idea what you want to major in? Our advisors can help with that, too. Almost as important as choosing your major and finding the right classes is the opportunity to put your learning into action. The College of Letters and Science offers many ways to apply your knowledge and skills through hands-on learning, networking, internships and research. Geology Field Camp is one example. Students spend six weeks in the wilderness learning how to document complex geological phenomena and becoming versed in fundamental field methods and modern mapping tools. Archeological Field School provides students with a foundation in archeological survey and excavation — training that often leads to jobs immediately after graduation in this growing field. Work of Art: Career Studies for Students in the Arts is a series of workshops that covers topics like creating a presence in cyberspace, networking and interviewing techniques tailored to arts majors. The college also encourages liberal arts majors to dive into research and take advantage of the wide array of opportunities to put their questions and ideas to the test, from partnering with faculty on cutting-edge research and novel new applications, to collaborating with other students in a gaming lab, to presenting research findings at conferences and talks. Preparing students to thrive as leaders, collaborators and innovators in the multidisciplinary, communication-intensive 21st century is one of our greatest strengths as a college. Within a few months after graduation, 46 percent of UC Davis graduates receive more than one job offer. Your major may lead straight to the career you imagined. Or perhaps it will lead somewhere different, but better than you imagined. One thing you can count on at the College of Letters and Science is that we help our students harness the power of the liberal arts to build lives of endless possibilities. In future posts, we’ll delve more deeply into specific majors and share the stories of Aggies who are not only thriving in life after college, but are also shaping careers of the future. Make sure you keep on reading our blog. Donna Justice is director of marketing and communications for the College of Letters and Science. She has been telling the story of UC Davis for nearly 18 years. An English major in college, Donna often tells up-and-coming marketers there is no map to the “right career,” only intention and a dash of serendipity.